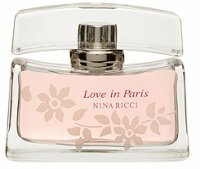 Nina Ricci has launched Love in Paris Fleur de Pivoine, a new limited edition variation on 2004's Love in Paris fragrance. It is described as a romantic spring-time floral, and the notes include mandarine, pink pepper, neroli, cassis, peony, raspberry, rose, violet, patchouli, heliotrope and Georgia wood. Other recent fragrances from Nina Ricci: Nina, L'Eau du Temps. Pink pepper is all the rage for 2007, isn't it?! Actually, several of the notes in that list remind me of Bryant Park from Bond No. 9. Have you sniffed this one, R? Pink pepper does seem big, actually, I'd say for the last couple years. Nope, haven't smelled it, and not sure if it is in the US yet — and for that matter, I've never smelled the original Love in Paris. I will never catch up!